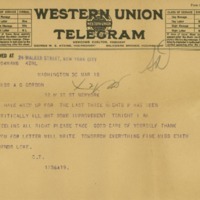 Cary T. Grayson sends a telegram to his fiancée, Alice Gordon Grayson, that President Woodrow Wilson has been critically ill. I HAVE BEEN UP FOR THE LAST THREE NIGHTS P HAS BEEN CRITICALLY ILL BUT SOME IMPROVEMENT TONIGHT I AM FEELING ALL RIGHT PLEASE TAKE GOOD CARE OF YOURSELF THANK YOU FOR LETTER WILL WRITE TOMORROW EVERYTHING FINE MISS EDITH SENDS LOVE. Grayson, Cary T. (Cary Travers), 1878-1938, “Cary T. Grayson to Alice Gertrude Gordon Grayson,” 1916 March 18, WWP20968, Cary T. Grayson Papers, Woodrow Wilson Presidential Library & Museum, Staunton, Virginia.